It is often suggested that the Jaws franchise represents the steepest decline in quality between the first/best and last/worst entries in a given series anywhere in cinema history. This is almost certainly the case, but to tell the truth, the bulk of that drop was done right away - it might, in fact, also stand as the steepest decline between two concurrent entries in any series*. The 1978 Jaws 2 isn't awful by any means, not by proper bad movie standards; but it sure as hell isn't any good. And coming three years off of one of the great popcorn movies in all of history, and one of the best thrillers and best monster movies et cetera ad infinitum, the movement from that down to "isn't any good" is a lot worse than the further movement from "isn't any good" to "strips the paint of your walls, it's so bad", or at least a lot more depressing. Jaws 2 opens the same way its predecessor did: exactly the same way, with a bubbling "underwater" sound playing beneath the Universal studio leader, followed by some POV underwater photography during the credits. This is not the last time that the film will do exactly the same thing as the first Jaws, though it will be the only time doing so works to its advantage. We meet up with a pair of scuba divers exploring the wreck of the Orca, Quint's boat from the first movie, when from out of nowhere, a very familiar bassline picks up and we see flashes of grey as they are devoured, with a rather notable paucity of blood. One of the divers' cameras hits the sea floor in just such a way to take a flash photo right back in the direction of the attack. This is, incidentally, the point at which the film loses me - as a sequel to Jaws, anyway. One of the chief bits of genius in that film was the way that it foreshadows future events with great subtlety, enough so that it takes at least a second viewing to realise that it even was foreshadowing in some cases. That camera, meanwhile, is shot in such a way that can only tell us, "look at this PLOT POINT!" and you can pretty much bet your bottom dollar that the camera is either A) how the protagonist discovers that there is a shark attacking people, or B) how the protagonist proves the same to other people. As it happens, it is both of these things. Anyway, it's an insert shot that pretty effectively waves bye-bye to subtlety for the whole rest of the film. I assume I can be forgiven for skimping on plot synopsis, and if not, then maybe you'd like to come over here and review the most boring of the four Jaws pictures (being as it is nowhere near as good as the first, and lacks the traces of true stupidity that make the latter two fun bad movies). Short version: we are re-introduced to Amity Island Police Chief Martin Brody (Roy Scheider), whose fear of water has returned after an exquisite final pair of lines in Jaws suggested otherwise, and his wife Ellen (Lorraine Gary), who is now working with a land developer trying to build a series of chic condos on the Amity waterfront. This serves as the new film's "summer tourist season" analogue that causes Mayor Vaughn (Murray Hamilton) to nervously deny even the remotest possibility that Brody is right about a second massive Great White Shark hunting the waters around the island, when that time comes. 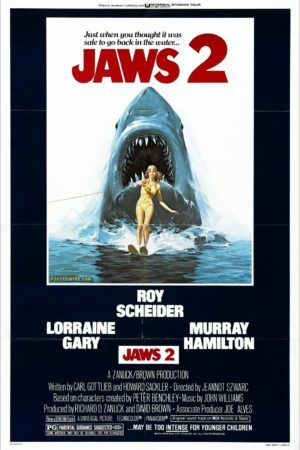 Everybody says this, but only because it's true, and because it is the single biggest reason that Jaws 2 simply Does Not Work as a sequel: it beggars belief that a second record-breaking shark would come to the same waters to torment the same people just a few years later, and granting that, it beggars even more belief that the very same people who survived the previous film would respond to the idea of a giant shark in this film with such a blithe, "can't happen!" attitude. It is the kind of contrivance that no amount of suspension of disbelief can possibly overcome: a second big shark we can buy, since that is why we have come to see a film with the title Jaws 2, but the idea that everyone - every last single character who isn't Martin Brody - is so dead-set against the mere idea of a giant killer shark that they will not even, for a single minute, contemplate that it might be the case, that just seems like it's begging for an excuse to give Jaws 2 several of the same exact story beats we'd already seen in Jaws and, by 1978, several of its quickest rip-offs, only with the characters being both more stupid and less sympathetic (in the first film, Vaughn's refusal to close the beaches had a tragic tinge to it; here it seems like criminal negligence). I'm getting well ahead of myself: before Brody can think that there is a shark, there has to be a mysterious violent death at sea, and before we get to that point, we're introduced to the subplot: the elder Brody son Mike (Mark Gruner), and his passel of friends, crushes, rivals, and so on. If this movie had come out even one year later, you'd swear it was a Halloween rip-off: it feels so damn much like a spectacularly ineffective attempt to marry the killer animal film with the dead teenager slasher film. Eventually, the shark strikes, taking out a pair of women on a water-skiing adventure; and right around the 30-minute mark, Brody starts to smell a shark. For comparison's sake, by the 20-minute mark in Jaws, Amity is already in full shark-hunting mode, and we're off and running on our way to the second hour. Jaws 2 has almost the same running time as its predecessor, and takes so much more time doing anything, lumbering along where the original is sleek and urgent. This leaves us with 90 minutes or so of Brody trying to convince people there's a shark, getting fired for being a little bit free with shooting guns at shadows in the middle of a crowded beach, and all the teens go off to get drunk right smack dab in the middle of the shark's feeding grounds. It's really not very interesting, although every now and then the nugget of interesting crops up: the bits detailing how the Brodys have put their lives back together are typically the best-acted in the film and the only ones with characterisations really worthwhile. The slack pacing is one of the biggest problems with the film; this can be partially laid at the feet of screenwriters Carl Gottlieb (returning from the original) and Howard Sackler, and the previous individuals whose work they were revising (Jaws 2 had a fairly major overhaul in its conception shortly before shooting was to begin), for larding it up with so much deadweight. More of it can be blamed on director Jeannot Szwarc, who you have heard of for no other reason; no Spielberg was he, making a killer shark movie so brisk and excellent that it turned into a major career that would help to re-shape the medium. Simply put, Jaws 2 is more obvious than Jaws, assuming we are stupider, so that everything has to be spelled out, and showing us much more of the shark, which is a slightly more convincing machine than in the first picture, except not when you get to see such lingering close-ups of its various shortcomings. The flimsy "evil builder" subplot is so trivial in the grand scheme of the whole movie as to hardly justify its running time (it was probably stuffed in their to give Lorraine Gary, AKA Mrs. Sid Sheinberg, President of Universal, more to do), while the teen subplot is simply odious; better than you'll find in any given '80s slasher film (the kids are marginally more interesting, their personalities slightly more defined), and considerably worse than the very lowest moments in Jaws, if there are any such things. And yet, it's not a horrible movie; it's even okay by the standards of the killer animal genre (no Grizzly, this). It is a perfectly serviceable shark movie, which shares the name, setting, and characters of the best shark movie that will ever be made, to its everlasting discredit. It is, like the original Peter Benchley novel, a trashy potboiler, but perfectly satisfying if you're looking for a bit of entertainment, with a couple of good setpieces - the water-ski sequence in particular is a marvelous little snip of thriller filmmaking, even if it feels much less organic than anything in the original, and ends with the truly stupid detail that the woman manages to blow up her own boat, giving the shark a nasty scar that... makes it look tougher, I guess? Best not to ask why things happen in Jaws 2. There are even a few things that make me positively glad it exists: Scheider's performance, while considerably broader than it was before (I don't want to say he's mugging for the camera exactly, but it's pretty close sometimes), still gives it the most grounding it will ever have; and John Williams's score. Aye, Williams, the only significant behind-the-camera figure to return (ignoring the producers, who had next to nothing to do with making Jaws good), and while the score isn't up to the standards of the previous year's Close Encounters of the Third Kind or Star Wars, the same year's Superman, or the following year's 1941, it's still a smart attempt to continue the best parts of the original score (the tension, the shift in moods), while developing a slightly more complicated musical language - at the risk of speaking complete heresy, and strictly referring to its musical qualities, I actually think the score to Jaws 2 even improves on Jaws, bringing in some of the minor key flavoring he used to such good effect in Star Wars to deepen the soundscape. So no, Jaws 2 isn't a complete waste; it's just a missed opportunity that probably was never going to be a whole lot better, anyway. No, the complete waste would happen the next time the franchise raised a menacing fin above the water. Return of the Jedi > The Phantom Menace doesn't count.